Bought through desperation as old boots began letting in rain,I read other reviews and took advice to go a size bigger and glad I did although it took a little re-adjusting my foot placing on pegs. Very comfortable boot,rigid to begin with but broke in very quickly,very snug around ankles so wont go around my bike trousers so getting used to them going over boots. I have only been in a few heavy showers with them on and feet bone dry, no torrential downpours experienced yet. For the price and quality of the boot I'd highly recommend. Good comfortable boots. Got them to do my CBT take a bit of getting use to I got a size 9 but they are snug. Very good quality, stayed dry in Irish rain so very waterproof, went size up as per other reviews which is def needed, these fit very well but they are a snug fit width wise although I did manage thermal socks inside them comfortably. Ordered one size bigger and is perfect. Keen to try them in wet weather. Very flexible. Great help from the staff at sportsbikeshop regarding delivery. Excellent job. Second time buyer and looking forward to be a regular one. Love these boots. Feel solid and look good. A bit smaller than expected (or maybe my feet are bigger than I thought) so returned for a bigger size. Great boots! People said these are a slightly tight fit so i ordered a larger size, somewhere between my shoe size and walking boot size. They fit but are a little large, fine for on the bike but probably wouldnt want to walk round in them for miles (may be ok with thicker socks). Kept feet dry the other day when we had to stop to put on extra waterproofs !. Ordered pair for wife as well and there the same and fine. Excellent boots. I'm a size 12 but purchased size 13 as they can be a wee bit tight at your shoe/boot size. Seems a well made boot. Not used in heavy rain yet. Delivery was excellent. Only worn them a couple of times so far but they do make a big difference to the ride comfort after you get used to having them on. 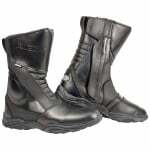 (missed the gear change and rear brake to start with as I am use to wearing softer boots) Cant say if they are waterproof as I don't tend to ride in the wet but they are certainly comfortable and sturdy. had to order next size up as they are quite tight fitting. Well made comfy boot, not worn them in the rain yet to test the waterproofness.